NOTE: This content is old - Published: Tuesday, Feb 24th, 2015. The winner of Wrexham’s Best Burger was announced today – with the Royal Oak in Bangor-on-Dee named as the champion. Over the past six weeks the hunt has been on to find Wrexham’s Best Burger with 13 eateries across the county narrowed down the the final three, with The Mulberry Inn, Llwynmawr, The Royal Oak, Bangor on Dee and Cygnets Restaurant, Pontfadog being on the final short list created via mystery shoppers. 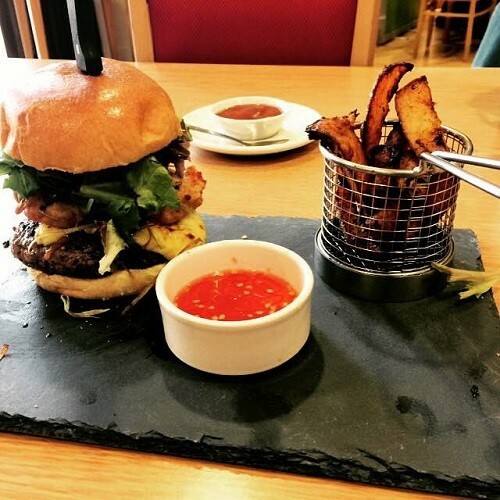 First on the menu was the ‘Dafydd Burger’ courtesy of The Mulberry Inn – a hand-made Welsh Black Beef-burger rippled with Laverbread and glazed with Rarebit; topped with Smoked Bacon and Home made fritters. The burger was also served with chips, a house made “Welsh Dragon” Sweet Chilli Dip and a crispy leek salad. Second on this afternoon’s menu was a Lewis Farm lamb and leek burger courtesy of the Royal Oak. The burger was topped with Y Fenni cheese on a home made focaccia bun, and served with mint yoghurt, onion rings and hand cut chips. Head Chef Martin Roberts told the panel that all ingredients were sourced locally, with the foccaia bun made fresh and the meat left to marinate for 12 hours. 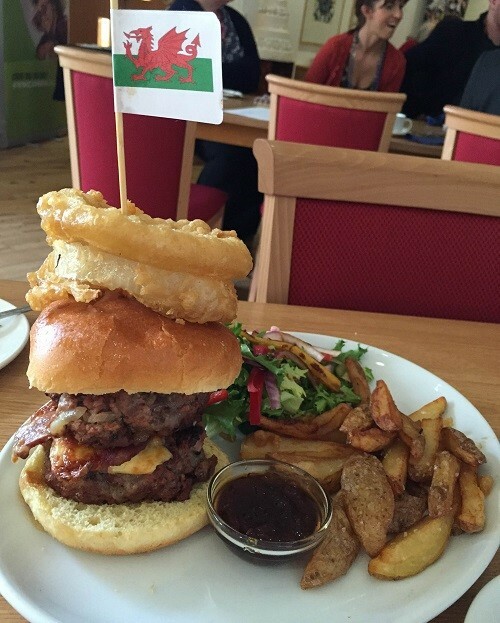 The final burger up for this afternoon’s taste test was a double Welsh beefburger provided by Cygnets Munchies – we described on Twitter as an ‘utter beast’. 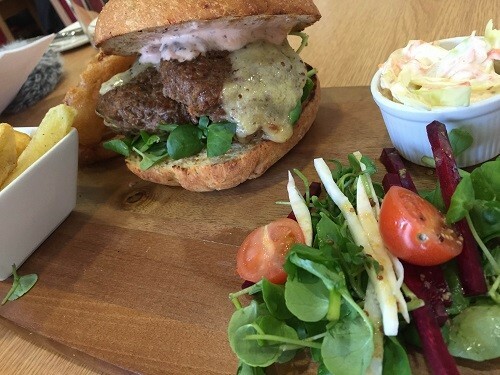 The burger was made with Welsh beef mince, smoked bacon rashers, Bodnant Dairy Aberwen extra melted cheese – onion rings, home made chutney and chips. Naomi Payne from Cygnets told the panel the burger was based on the 1200 year-old oak tree that fell during the storms last year, with the cheese and bacon smoked from oak shavings. Naomi added chefs only have to walk 10 steps from the restaurant to produce the chutney served with the burger. 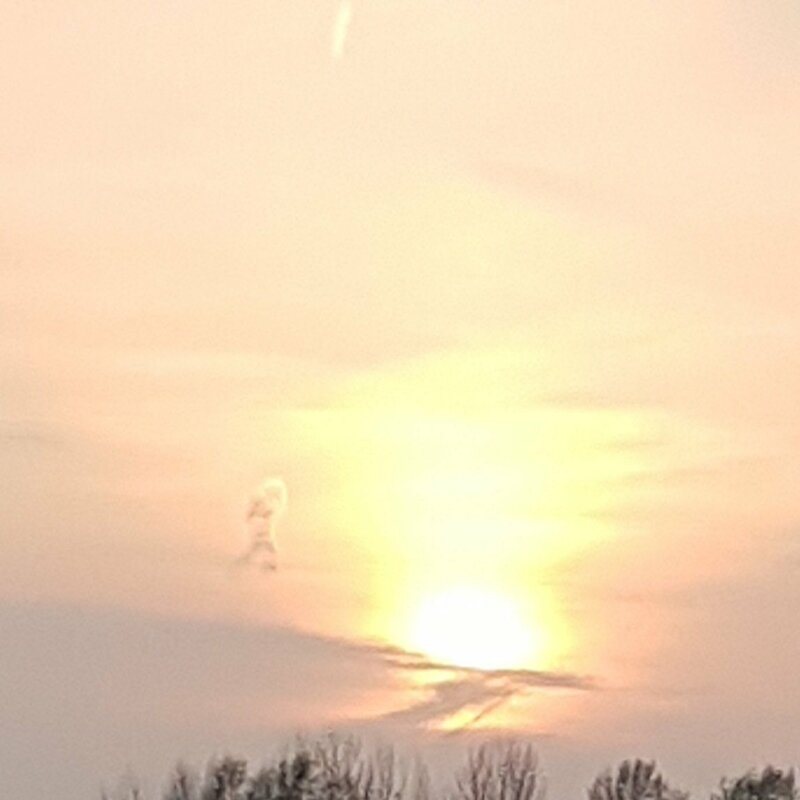 After the difficult task of eating all the burgers the judging took place, with competitors were told it was a ‘tough’ decision choosing the overall winner. The Royal Oak lamb burger was crowned the winner of the competition, with the Mullberry Inn taking second place and Cygnets taking third place. 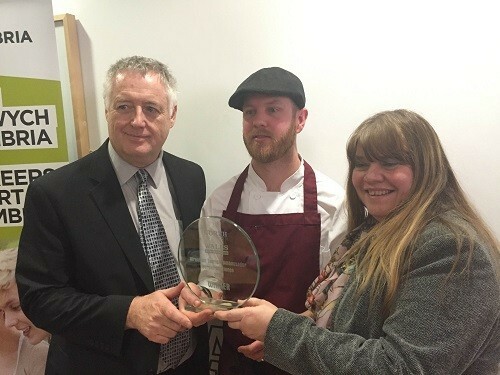 Thanking the panel and the audience, Head Chef Martin Roberts described the award as a ‘proud moment’. Julia Jones, Deputy Curriculum Director at Coleg Cambria gave a short presentation to businesses present on courses offered at the college, with the aim to develop further links with employers and work based learning opportunities. 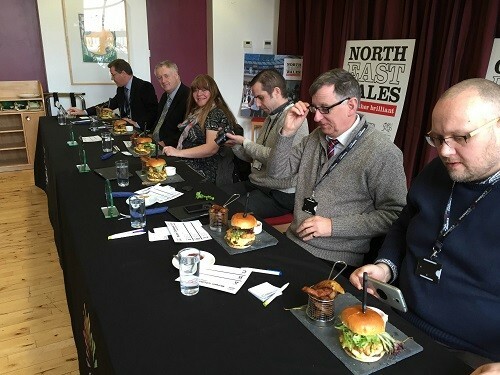 The 2015 Wrexham Burger Challenge has been designed by the Wrexham Destination Management Partnership with the aim to raise the profile (even further) of the great local produce and also to raise the profile of some of our amazing eateries in that this part of North East Wales has to offer the local area – and going by the feedback it appears to be a success! Well done to all those who took part in the competition and a big congratulations to the team at Royal Oak! Read 1,258,835 times in last 30 days, and 73,813,158 times since we started in 2011.